Meet Leo, he’s a happy-go-lucky Cavoodle who always has a smile on his face. That is until one day when Leo was brought to Animal Emergency Service Jindalee in devastatingly bad shape after being hit by a car. Dr Deeanna Ho admitted and examined the Cavoodle with urgency, and after tests were performed, it was discovered that Leo’s front left leg needed to be amputated. The Vet team spoke to Leo’s owners and explained the implications of amputation, and they immediately to have Dr Ho perform the necessary surgery. Thanks to the dedicated surgical team and around the clock monitoring, Leo made it through the surgery and was ready to start his recovery. We fell in love with Leo – after being hit by a car, undergoing major surgery and losing a leg, he managed to fight through and keep us smiling with his playful antics. Leo was able to make a full recovery and return home to his caring owners, and we all thought that was the last we would see of brave little Leo; but we were wrong. 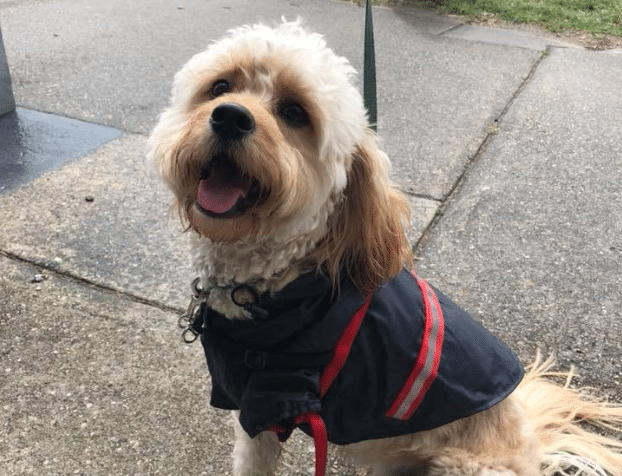 A few months later one of our customer care representatives, Demi, was out looking for some breakfast on a Saturday morning and was greeted by a beautiful Cavoodle with a big smile, playful eyes and three legs. It was Leo! She recognised the owners and the pup immediately.